After Death Of Teen Who Drank Liquid Meth At Checkpoint, Lawmakers Call For Action A Mexican teenager died in 2013 after drinking liquid methamphetamine, allegedly at the request of customs officers at the San Ysidro Port of Entry near San Diego. In a video, two customs officers appear to be gesturing at Cruz Velazquez Acevedo to drink from bottles that turned out to contain liquid methamphetamine. 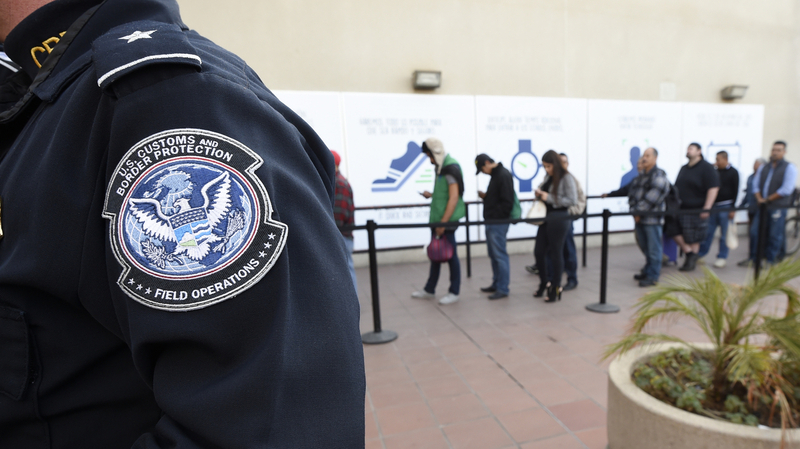 Lawmakers are asking the Department of Homeland Security to improve training in response to the 2013 death of a Mexican teenager who drank liquid methamphetamine at the alleged request of customs officers at the San Ysidro Port of Entry near San Diego. "What happened to Cruz Velazquez was absolutely horrible, and we must guarantee that something like this never happens again," Rep. Juan Vargas, D-Calif., said in an email Monday to KPBS. "I am requesting an immediate response from the Department of Homeland Security to ensure that proper training is put in place for Customs and Border Protection agents." Vargas' statement is the latest in a string of similar calls for action from members of Congress after video showing the events leading up to the death of Cruz Velazquez Acevedo aired for the first time on ABC News. In the video, two customs officers appear to be gesturing at Velazquez to drink from the bottles of liquid methamphetamine and laughing when he does. According to court records, the officers asked the boy to drink the liquid to prove it was not meth. The boy claimed the bottles contained apple juice, but the officers were suspicious because he seemed nervous. Velazquez, who was 16 years old, died later that day from the overdose. "Either the officers involved were very negligent or they were deliberately cruel or some combination of both. That suggests to me that training and appropriate screening before people are hired needs to be done," he said. "No discipline of any kind was imposed (on the officers) — not a day off work, not a penny less in salary, not even a letter of reprimand in the file." Customs and Border Protection confirmed that the agency did not discipline the officers involved in the incident. The U.S. gave the family a $1 million settlement earlier this year. "U.S. Customs and Border Protection conducted an investigation following the incident at the San Ysidro port of entry in November 2013. Additionally, the San Diego Police Department conducted an in-custody death investigation. On January 24, 2014, the SDPD provided a copy of their investigation to the U.S. Attorney's Office, which declined to file charges. "CBP's Office of Professional Responsibility continued to review the case, spending nearly a year that included a national-level review board, which in September 2014 also determined that no further action was warranted and the officers involved were not disciplined. "CBP Officers are our front line representatives protecting our country. In the San Diego Field Office alone, our officers encountered more than 75 million people last fiscal year. In spite of those vast numbers of daily interactions, our officers work hard to do the right thing every day, ensuring that they allow legitimate travelers into the U.S. while stopping illegal activity as well as working to ensure the well-being of the travelers that we are encounter." The Department of Homeland Security plans to hire thousands of new officers in the coming months. The attorney, Iredale, said this makes it all the more urgent for the agency to implement new training measures to make sure this kind of thing doesn't happen again. "This was a 16-year-old boy who was doing something admittedly wrong, who was doing something for which he deserved possibly to be punished, certainly to be brought before the court and called upon to answer for his conduct, but instead these agents decided to have a little fun at his expense and take the risk that they imposed on him, that he would die — which is exactly what happened," Iredale said.